On the first round of calls for our Montana poll something happened I've never seen before: the candidates were literally dead even on the raw counts. In most states that would mean the Democrat is well ahead, because we usually have to weight our samples to bring up the black population. But I don't think that's an issue in Montana! So basically that means the leader, at least based on this first round of calls, would hinge on what's bigger: the gender gap between the candidates or the age gap. We almost always have to weight our polls to make them more male: women are just more likely to answer the phone. That weighting benefits Republicans. But we usually also have to adjust our samples to make them younger, bringing up the 30 and under crowd and decreasing the share of senior citizens. That helps Democrats. We'll be making callbacks throughout the weekend but the bottom line is that the state is really close. -35. That’s the percentage of white Democrats in the Charlotte metropolitan area planning to vote for McCrory. For him to win statewide he’ll need to maintain that level or higher of folks voting for their region over voting for their party. -54. That’s the percentage of voters planning to support Libertarian Michael Munger who are also planning to vote for Barack Obama. Usually you would expect a Libertarian candidate to pull from the Republicans, but Munger has run to the left of Perdue on issues like immigration and capital punishment and because of that he seems to be pulling most of his support from liberal Democrats. If the Governor’s race ends up being decided by less than a point that could be a difference maker. -9. That’s how many points ahead of John McCain Pat McCrory is running in suburbia across the state. His message of building more roads and infrastructure in the fastest growing parts of the state seems to be resonating there. -91. That’s the percentage of people who have already cast a vote for Barack Obama who also voted for Perdue. There had been some concern about whether all the new voters coming out to support Obama would also vote the rest of the ticket, and for the most part it seems they are. That could help put Perdue over the top. -20. That’s the lead Perdue has in her home region of eastern North Carolina. She needs a strong performance there to offset McCrory’s strength in greater Charlotte, and ads focused on things like mega landfills being dumped in that part of the state have helped her shore up some support in the last few weeks. -24. That’s the margin by which people who have already voted supported Perdue, 60-36. The big question is whether enough Republicans will turn out on election day itself to make up for the headstart that Perdue- and Obama and Hagan as well- have built up with the most eager voters. So much for the Democrats' party unity problem. Who would have expected that one three or four months ago? The party is clearly behind its nominee, and McCain's degree of party unity actually even seems to be declining a little bit relative to the summer. When you're putting up those kinds of numbers with voters in the middle you're going to win. We have a pretty tight likely voter screen and I do think that John McCain is going to do a lot better with the votes still to come, but it's always better to have acutal votes than speculative votes. One last point: I've been pretty skeptical of the Arizona polling all week but Obama's remarkable performance in New Mexico makes me think there might be something to it. If Barack actually goes there before the conclusion of the campaign we *may* try to sneak in one extra poll. Barack Obama is set to win a double digit victory in Michigan. He's taken a 49-48 lead with white voters, representing a significant improvement in the state for him. Just two months ago McCain was up 54-38 with whites. Add in Obama's 90+ percent rate of support from black voters and it's the equation for a lopsided win. Obama is up 53-40 with independents, and he's also winning more Republican votes (13%) than McCain is Democratic votes (8%). Concerns about Democratic unity in the wake of the fiasco regarding the state's delegation to the national convention seem to have fallen by the wayside in the light of increased voter concern over the economy. Obama has a remarkable 73-20 lead with poll respondents who didn't vote in the 2004 election, but he's also putting up a good standing with some of the most reliable voters out there, senior citizens. He has a 52-44 advantage with that demographic. In the state's US Senate race Carl Levin is cruising to reelection. He leads challenger Jack Hoogendyk 58-36, with the 22 point lead matching the largest he's shown in a PPP poll this year. New Mexico is a candidate to be the state with the largest turnaround in its voting pattern relative to 2004. Barack Obama is blowing out John McCain in this place that went red just four years ago. Obama is doing very well with two key groups of the state's voters. Among independents he has a 66-28 lead, and with Hispanics he's up 62-37. This may begin to sound like a broken record, but he's also banked a huge lead with those who have already filled out their ballots. 56% of poll respondents reported having done that, and within that group Obama is leading 64-36. He is up by a much more modest 50-47 tally with those who have yet to vote. We interviewed 1,537 people in New Mexico. 866 of them said they already voted, and 550 of those people said they voted for Obama. That means that if this was an accurate sampling of the population, Obama would need to win the votes of only 219 of the remaining 671 people polled who had not actually filled out their ballot. It seems a good bet that 33% is something they can handle. Tom Udall is up 58-39 in his Senate bid. Jeff Merkley is continuing to expand his lead in his quest to defeat Gordon Smith for reelection to the US Senate. He has a 59-37 advantage with those who have already voted and he's winning 45-39 with independents. This race has been universally headed in Merkley's direction for weeks now and it's probably too late for Smith to turn it around. In Oregon's races for Secretary of State and Treasurer the Democrats lead. Kate Brown is up 51-40 for the former office, and Ben Westlund is up 47-41 for the latter. With the election still four days away, Barack Obama has already received close to the number of votes he needs to win Oregon. 59% of poll respondents said they had already filled out their ballots, and within that group Obama has a 64-35 lead. John McCain is winning 52-45 with those who have not yet voted. Look at it this way: we polled 1,424 people in Oregon. 839 of them had already voted, and 539 of those people voted for Obama. That basically means that out of the 585 people in our sample who had yet to fill out their ballot Obama would need 174, or a little under 30% to get to 50% +1. It's safe to say he'll win Oregon in a blowout. Oregon is a rare state where Obama even has a 51-45 lead with voters over 65. He's winning more Republicans (11%) than McCain is Democrats (9%) and has a 53-41 advantage with independents. Mark Udall continues to expand his lead in his quest to move up from the House to the Senate. He's banked a 60-38 lead with those who have already voted, is winning 60-31 with independents, and is winning every racial and age demographics. Not much else to say on this one. It's over. Barack Obama's already just about won the race for President in Colorado. 65% of the folks we surveyed said they had already voted, and among those respondents Obama is winning 58-41. Folks planning to vote on election day support John McCain 50-47, bringing Obama's overall lead down to ten points. Let's look at this another way. We interviewed 2,023 people. 1306 had already voted, and 761 of them voted for Obama. That means out of the remaining folks Obama would only need 251 out of their 717 votes, or 35%. Since 47% say they intend to vote for Obama it seems like a safe bet that he'll get there. Obama continues to dominate with independent voters in the state, leading 60-36. Colorado is yet another state where he is winning modestly more Republicans (13%) than John McCain is Democrats (10%). So much for the Democrats' party unity problem this year. The race for US Senate in Minnesota is close, but Al Franken has a definite lead at this juncture in the contest. Franken and Coleman are doing a roughly equally good job of holding onto each of their party's voters. Coleman gets 85% of Republicans and Franken is earning 81% support from Democrats. That's important because it's an indicator that Barkley is pulling roughly equally from each party, a different conclusion than some other recent polling has found. 55% of Barkley's support is coming from independent voters, and he's running pretty close to the major party candidates with that demographic- Coleman is at 35%, Franken 34%, and Barkley is getting 26%. Only 76% of Obama voters are planning to vote for Franken, quite a difference from the 85% of McCain supporters going for Coleman. But with Obama headed for a dominant victory in the state, it looks like as of today his coattails would be enough to bring Franken across the finish line. What impact the lawsuit Coleman filed against Franken today and whatever else happens in the last five days of the election has remains to be seen. Barack Obama is headed for a remarkably dominant victory in Minnesota. -17. That's the percentage of people who voted for George W. Bush in 2004 who now plan to vote for Obama in the state. -42. That's the lead Obama has with new voters, 65-23. -18. That's the advantage Obama has with independents, 55-37. Also worth noting: Obama wins 12% of Republicans while McCain wins only 6% of Democrats. This is one state where party unity is most certainly not an issue for the Democrats. West Virginians may not be voting for change when it comes to President, but it does look like they're ready to select a new Attorney General. Republican challenger Dan Greear leads Democratic incumbent Darrell McGraw 50-42 for that office. There is better news for Democrats in other offices. Governor Joe Manchin is coasting to reelection, currently holding a 69-27 lead. He even leads 51-46 among Republican voters, something I'm pretty sure we haven't seen in any other polling we've conducted this year. His advantage with independents is 70-24. Jay Rockefeller is going to be headed back to the US Senate as well, leading his Republican challenger 58-40. Democrat Natalie Tennant is up 58-31 in her quest to become Secretary of State, and Gus Douglass is up 50-41 as he looks to make it an 11th term as Agriculture Commissioner. John McCain appears headed for an easy victory in West Virginia. Since PPP polled the state two weeks ago his standing has improved by five points while Obama has remained in place. It appears this is one state where undecideds are moving overwhelmingly toward McCain. Obama was never going to have a very good chance of winning the state if he couldn't improve his standing with Democratic voters, and in this survey he leads only 65-31 with them. McCain is receiving 90% support from his party, and also leading 53-39 with independent voters. Obama is doing comparatively well with young voters, among whom he has a one point lead. But he is doing particularly poorly with the middle aged segment of the electorate. He is down 59-37 with voters between the ages of 30 and 45, a performance that does not bode particularly well for future Democratic Presidential prospects in the state. There is not going to be a dump of all the polls at once at 10:30 tonight or on Sunday night. We'll be posting them one at a time as we finalize them throughout the night each of those evenings. For instance, our Oregon poll won't even be out of the field until midnight tonight so final results aren't likely until a while after that. The first one up will be West Virginia. It doesn't look like good news but don't get flipped out about the rest of them just because of that one. Tonight we will be finishing field work on our final polls in Colorado, New Mexico, Michigan, Minnesota, West Virginia, and Oregon. The PPP team will be working through the night and posting each of these polls as soon as it is weighted and analyzed. So if you're an insomniac and so worked up about the election that you can't sleep at night we will help feed your addiction. Polls will start going up roughly around 10:30 or 11 PM. When we look back on it the 2008 Senate election may be remembered as a contest of numbers. 92 and 93, as seared into the consciousness of North Carolina voters through a DSCC advertising campaign, have been vital in efforts to tie Elizabeth Dole to George W. Bush and the nation's economic woes, as well as to make Dole out as an ineffective Senator. That's propelled Kay Hagan into the lead in our last eight polls. -18. That's the percentage of people who voted for Elizabeth Dole in the 2002 Senate race but are now backing Kay Hagan. That's a lot of lost support for the incumbent since she was first elected. -7. That's Hagan's lead among female voters. Dole got a lot of crossover Democratic support and did very well with woman independents when she ran originally. By nominating another woman the Democrats effectively neutralized any advantage Dole received there in 2002. -8. That's the share of the black vote Dole is currently receiving. In 2002 her celebrity and moderate veneer helped her to do much better with African American voters than most Republicans do. Fully 25% of blacks in our last poll who voted in 2002 said they voted for Dole but she's lost almost all of that support this time. -17. That's the proportion of North Carolinians planning to vote this fall who say they did not cast a ballot in the 2002 Senate race. Between in migration and the awakening of the apathetic, there are going to be a lot of folks coming out to vote this year who were not part of the North Carolina electorate when Elizabeth Dole was first elected. Those folks are overwhelmingly supportive of Hagan, by a 58-28 margin. -50. That's the percentage of independent voters Hagan is receiving, 18% more than Dole. The Republican incumbent won with that demographic in 2002 but independent voters are going for the Democrats in the federal offices by a wide margin this time around. Your average undecided for President at this point is a rural Democrat, probably in eastern North Carolina, who voted for Bush in 2004 but is thinking about voting for Obama because of the economy. It’s your typical ticket splitter- Republican for President and Democratic for Governor- identifying yourself as a Democrat but uncomfortable with the stance of ‘national’ Democrats on key social issues like abortion, gay marriage, etc. The conundrum for this voter: put the economy first and vote for Obama or puts values issues first and vote for McCain. The race has tightened up in the state over the last few weeks as more of those people have returned to their normal voting habits and decided to back McCain. In both the Senate race and the race for Governor the undecideds are overwhelmingly Barack Obama supporters who don’t know what, if anything, they’re going to do on the rest of the ballot. A third of them didn’t vote for President in 2004. A plurality are independents, a lot of them are black, and a lot of them are young. They’re the kind of folks who are uniquely attracted to Obama’s candidacy and probably wouldn’t even be turning out this fall if Hillary had ended up with the nomination. There’s good news and bad news for Hagan and Perdue on this front. The bad news is that they’re voting for Obama because they like Obama- not because he’s a Democrat. So they aren’t necessarily going to be straight party voters. The good news is that among people we surveyed who already voted, more than 90% of them said they voted for Perdue and Hagan too. That’s actually a little higher than the rate of people who voted for McCain that said they would also choose McCrory and Dole. Earlier in the fall we picked up on a somewhat surprising trend: more North Carolinians were planning to vote Democratic for President and Republican for Governor than the other way around, bucking the state's overwhelming historic trend. Now those numbers seem to be going back to normal. Three weeks ago 54% of people planning to vote Democratic for one office and Republican for the other when it came to President and Governor were planning to vote for Barack Obama and Pat McCrory. Now 66% are going with the more traditional combination of John McCain and Bev Perdue. This return to form is largely a function of both Barack Obama and Pat McCrory struggling to overcome obstacles to their candidacies in eastern North Carolina. 56% of the McCain/Perdue voters come from the east. Although there has been a lot of bluster about voters going for Obama and McCrory because they want change across the board, the reality is that fewer than 3% of North Carolina voters are planning to choose that particular ticket. Last week we analyzed young voters in the swing states and found that even if there wasn't a big increase in turnout from the under 30 crowd this year, there would still be a big shift toward the Democrats because of changing preferences within that demographic. I am much more confident that there will be a large increase in black turnout than I am that there will be a large increase in youth turnout, but the same truism applies to black voters: there will be a major movement toward the Democrats with them whether there's a large increase in turnout or not. Take North Carolina as the biggest example. The 2004 exit poll showed John Kerry winning black voters in the state 85-15. A private poll we conducted statewide over the last few days showed Barack Obama winning them 95-5. That may not sound like a huge difference, but look at it this way. Kerry won them by 70. Obama's winning them by 90. Let's conservatively put black turnout at 20%. A 20% improvement with 20% of the population is worth an extra four points for Obama statewide. That's a huge deal. It's a similar story in a couple other states that look like they'll be incredibly close. In our most recent Florida poll blacks who said they voted in 2004 went 87-13 for Kerry. Now they're 91-8 for Obama. That nine point increase with 13% of the likely voting population is worth a little more than a point statewide. Could make the difference in an incredibly tight race. The same holds true in Indiana. Kerry won 83-17 with the African Americans we surveyed who voted last time. Obama leads 89-11. A 12 point shift with roughly 10% of the population is worth a little more than a point as well. Could swing it. Blacks have certainly always been supportive of the Democratic Party, but not to the extent that they are this year. That's why analysis suggesting that Obama won't get that big a boost from black voters because Democrats always get a big boost from black voters is off the mark. Even small shifts could make a big difference in some of the closest states. WRAL commissioned a poll in the US Senate race and got one of the candidates' names wrong. Christopher Cox may be the chair of the Securities and Exchange Commission but he is not the Libertarian nominee for US Senate. That would be Christopher Cole. Probably doesn't have any real impact on the numbers but it makes you wonder how much care really went into the poll. -The Dole campaign hasn't floated an internal poll, at least that I'm aware of, since July. Given that 12 public polls in a row have shown Hagan with the lead, you would think that if Dole's numbers were telling her anything different they would be trying to push those on the media. But they haven't, and for the most part they even seem to have stopped bothering attacking every poll that comes out not to their favor. -Their new Godless Americans ad simply smacks of desperation. It's the 2008 version of Jesse Helms' hands ad. The problem is that North Carolina has changed a heck of a lot since then, and I'm not sure that kind of campaign tactic is still going to be effective here. Hagan is doing well because she's so popular with suburbanites, the folks who have moved here from outside the state. Is this kind of bogeyman really going to work with them? I doubt it, but I guess we'll see. One thing's for sure: Hagan's banked a 61-35 lead with those who have already voted. Dole is playing major catch up, and even if this ad is somehow effective, it may be too late. -41. That's his lead among people who didn't vote in 2004 (65-24) They're providing his current small lead in the state, as McCain is up 49-48 with those who did vote in the last election. -17. That's the numbers of points independents have shifted from 2004. Obama leads 51-39 with them after Bush won them by a modest amount last time. -13. That's the difference PPP found in an August report between how natives and non-natives of North Carolina are planning to vote for President. The newbies are for Obama, and they're comprising a larger and larger portion of the electorate. -59. That's the percentage of North Carolinians naming the economy as their top issue. The higher that number's gotten, the better Obama has matched up with McCain as fewer voters are making their choices on things like values issues and immigration that tend to benefit Republicans. -10. That's the percentage of people who voted for George W. Bush in 2004 now supporting Obama. It may not sound like a lot, but if not for those folks the new voters Obama's bringing out wouldn't be nearly enough. Not surprisingly 79% of these voters cite the economy as their top issue. If North Carolina is going to turn blue this year, major shifts in the Wake County political landscape since 2004 will be a primary driver in making it happen. Four years ago George W. Bush won the county by two points. Now Barack Obama has a commanding 57-40 lead there. There's no doubt that in migration and new voters are a huge factor in this movement. Among people voting for President in Wake County for the first time he has a 72-26 lead. He's up by a remarkable 61-28 margin with independents in the county, and has banked a 70-29 lead with folks who have already voted. We predict that there could be a shift of up to 80-90,000 votes in Wake County relative to 2004, which would make up about 20% of John Kerry's statewide gap relative to George W. Bush right there. This could have major implications up and down the ballot. Barack Obama might just bring folks like Al Swanstrom, running against Nelson Dollar, and Chris Mintz, running against Neal Hunt with him. Wake County is also providing a huge boost to Kay Hagan's prospects for election to the US Senate. She leads 55-41 in the county and has a 29 point edge with independents. Currently Republicans hold a 4-3 advantage on the Wake County Board of Commissioners, but if nothing changes between now and election day incumbent Republican Kenn Gardner will lose his seat to Democratic challenger Stan Norwalk and flip the balance of control on the board. Norwalk leads 49-40 in PPP's newest poll, a result pretty similar to a survey last month that showed him up 46-36. Norwalk is up 63-30 with those who have already voted and has a 47-31 advantage with independents. He has been attacked repeatedly by groups associated with the development industry in recent days, but there may be too much political clutter for that to break thorough. Also, PPP surveys of Wake County residents over the last seven years have repeatedly shown that county residents agree with the sorts of initiatives that Norwalk supports to make growth pay for itself, the very stances that he is being attacked for. In the other two Wake County commissioner races incumbent Democrats are coasting to victory. Harold Webb leads Venita Peyton 52-37, and Betty Lou Ward is up 53-38 on Larry Tilley. I'm afraid my post about our newest Governor poll yesterday may have left the false impression that I think Bev Perdue is writing off Charlotte. Far from it, she has actually made incredible strides in the region over the last year, without which her chances of being elected Governor would be significantly reduced. The first three times we polled a potential McCrory-Perdue general election match up, back in the winter, McCrory held a lead of at least 35 points in each poll in greater Charlotte. In fact the very first poll, conducted in December before McCrory even officially entered the race, showed him up 61-20 in his home region. After Perdue became better known to Charlotte area voters during her primary contest with Richard Moore her numbers relative to McCrory improved in two of our first three general election polls. Perdue cut his lead in the area down to 23 points in our first post-primary poll and 24 points in a survey conducted at the end of June. With the coming of fall, and as Perdue has devoted more time and money to the region with lots of visits and television ads, her gap relative to McCrory has been cut even more. In our last seven surveys McCrory's lead in greater Charlotte has fluctuated between 8 and 18 points, representing roughly a 20-30 point improvement for Perdue relative to last winter. Her improvement has come thanks to shoring up her support with black voters in the region, and peeling off a lot of the Democrats who were originally intending to vote region over party and cast a vote for McCrory. Although there are still a fair number of voters doing that it's not nearly as many as it was six months ago. Perdue will not win the Charlotte metro area, but she has been effective in campaigning there enough to significantly reduce her deficit such that as the race stands her performance elsewhere in the state will put her over the top. If she hadn't been so successful in winning over more Charlotte voters her margins elsewhere would not be enough. You wouldn't think there would be many folks who voted for John Kerry in 2004 and John McCain in 2008 given Obama's large national lead right now, but in four key battleground states we recently polled at least 6% of respondents who said they voted for Kerry in 2004 are now going for McCain this year. In Florida 11% of Kerry supporters are now voting Republican. In Ohio and North Carolina it's 8% and in Virginia it's 6%. The strongest common theme about these Kerry/McCain voters across the four states if that they're men. In North Carolina 67% are, in Virginia it's 60%, Ohio 57%, and Florida 51%. Perhaps they're national security voters who appreciated both McCain and Kerry's military service. What they are not is monolithically white. In Virginia 26% of them are black. In North Carolina 16% are. In Florida 20% are Hispanic. So the logical conclusion that they're all racists doesn't bear itself out. Most of them are Democrats- 61% in Florida and 51% in Ohio for instance. Those two were supposed to be big Puma states but given that the Kerry/McCain voters are overwhelmingly men I don't think that's necessarily what's driving it. Obviously a lot more Bush voters are going to Obama than the other way around, and Obama has a huge edge with new voters but it's interesting to note that there are those bucking the trends this year. Probably not enough to put McCain over the top though. John Kerry lost this district by 8 points in 2004, so Obama's lead represents a 14 point gain relative to that, pretty similar to what he will need statewide if he's going to win here. The candidates were tied when PPP last surveyed the district in August. Obama is up 45-40 with independents. This represents a four point gain for Perdue since trailing McCrory by three in the district two months ago. You can argue either way whether this is a good result for her. Mike Easley won the district 53-45 in 2000, so she's running well behind him. At the same time, there is a lot of Charlotte media market in this district so in that sense she's hanging strong. There's not much arguing whether this is a good performance for Hagan or not. Dole won the district 51-48 in 2002 so this signifies a 12 point reversal. Hagan's winning independents 42-36 and doing a better job with white voters than any of the other Democratic candidates in the district. These numbers bode well for her statewide prospects. Larry Kissell has taken the lead for the first time in a PPP poll of North Carolina's 8th Congressional District during this cycle. The lead Hayes showed in polling over the summer was somewhat artificial. In late August 16% of Democrats were undecided while just 5% of Republicans were, likely due to the fact that Hayes was known and liked by folks within his own party but Kissell was not as well known to his base voters. As he's made his case over the last two months Kissell's lead with Democratic voters has gone from 62-19 to 78-20. Kissell has also made in roads with independents over the course of the campaign. What was a 43-27 deficit with them is now a tie, 45-45. The best news for Kissell's chances might come in the numbers from those who have already voted. He leads 60-39 in the votes that have already been cast. There was some concern about whether black voters turning out to support Barack Obama would also vote for the rest of the ticket. So far 93% of African Americans who have already voted for Barack Obama also voted for Kissell. A five point lead isn't insurmountable by any means but Kissell is in good shape a week out from election day. Wood has led every single poll in this race, but this is the closest the margin has been as the better funded Merritt is able to run a more visible campaign. Marshall has led by a good amount in every poll of this race. Troxler is holding on in this Democratic year thanks in no small part to his carrying 20% of the Democratic vote. We realized if we polled every one of them on our final North Carolina poll next weekend it would be way too long. So we decided not to poll any race where there hasn't been a poll showing it within five points at least in the last couple months. Congratulations to June Atkinson, Roy Cooper, and Elaine Marshall on their inevitable reelections. Bev Perdue's campaign has made a clear calculus that they're willing to tick off Charlotte voters if it allows them to rack up the kind of margins they need to win in eastern North Carolina. Right now it seems to be working. One of the biggest things that has kept Perdue from running away with this race is that Pat McCrory has consistently shown a huge lead in the polls in greater Charlotte, including major in roads with white Democrats, that Perdue has not been able to match in her home base of eastern North Carolina. Perdue has worked hard to shore up her support in Charlotte, but McCrory has consistently led the polls there by double digits. So about two weeks ago it seems Perdue's campaign became heavily focused on the east. First she started running effective ads on Yankee trash, an issue that hits home much harder east of I-95 than it does anywhere else. Her newest set of ads attack McCrory for a Charlotte first mentality: if there was no inherent anti-Charlotte bias with voters outside the state of Mecklenburg, it seems, the Perdue campaign is trying to create one. How's it all working? In the two polls before this new strategy Perdue led by an average of 48-42 in eastern North Carolina. In the two polls since her average lead is up to 54-38, including a new high of 56-36 in this week's poll. We project eastern North Carolinians to cast around 28-30% of the vote for Governor, so a ten point increase in her lead in that region gives her an extra three points statewide. That's huge in a tight race. Of course folks in Charlotte aren't necessarily thrilled with Perdue's strategy. In the two polls before she started actively courting the east she trailed by an average of 52-41 there. In the last two she trails by an average of 53-39, with her 53-36 deficit this week the largest she's shown in Charlotte in a long time. So she's lost 3-4 points in a region of the state that will cast about 20% of the vote. That costs her a point statewide. Forsaking a point in Charlotte to pick up three in the east? Could make the difference in a close race. Although the early voting numbers in North Carolina so far have been very exciting for Democrats so far I am sorry to report that it appears they'll revert to normal. So far 28% of early voters have been black. We weighted our poll to 21% black turnout, and that made the percentage of black early voters in our poll 31%, pretty similar to what it has actually been. That leads me to continue to believe African Americans will account for 20-22% of the electorate, as I have thought all along. Looking at it another way, 49% of blacks in our survey said they had already voted. Only 29% of white voters said the same. If the whites planning to vote actually do follow through and do it the racial demographics of the North Carolina electorate will end up being almost identical to the state's population. Keep in mind this is still a big improvement from 2004 when blacks accounted for just 18.5% of general election voters. The party figures for early voters in our poll also closely match what they have actually been so far. The true figures have been 55% Democrats, 28% Republicans, and 17% independents. On our poll it came out 57-25-18. The party breakdown of those who have not voted yet but plan to for our survey is 44% Democrats, 40% Republicans, and 17% independents. So the party imbalance should revert to the 13-14% registration edge Democrats in the state hold as well. -Not only is Obama winning 63-36 overall in votes already in the bank, but he's up 60-34 with independents who have turned out already. There's been a huge spike in independent voters this year, and they certainly seem to be leaning toward Obama. -There is also very good news for Kay Hagan and Bev Perdue. There's been a lot of concern about whether Obama's supporters would just cast a vote for him and go home, or fill out the entire ballot. Among those who have already voted for Obama 92% said they also voted for Hagan and 91% said they also voted for Perdue. By a small degree that's a higher margin of party unity than the Republicans are showing- 89% of those who say they already voted for John McCain also say they voted for Elizabeth Dole and Pat McCrory. Bottom line on the early voters: it's a lot better to go into election day with a huge lead than not! For the eighth PPP poll in a row Kay Hagan leads Elizabeth Dole. Christopher Cole continues to poll relatively well, an indication that voters disgusted with the tone of the campaign may really end up casting their ballots for him. As a benchmark for this poll we asked respondents whether they voted in the 2002 Senate race when Elizabeth Dole first ran, and if so who they voted for. 18% of respondents who voted for Dole last time are now casting their ballots for Kay Hagan. She has lost much of her bipartisan support from six years ago. For instance, 28% of Democrats we surveyed who voted in 2002 chose Dole. Now she has the support of just 18%. A quarter of blacks who voted in 2004 said they case their ballots for Dole. Now just 8% plan to. 54% of independents in the poll chose Dole last time. Now Kay Hagan leads 50-32 with that group of voters. Those numbers give you a good sense of how Dole's broad appeal has declined. Another number gives a good indicator to how the state's electorate has change since 2002. Hagan is up 58-28 with those voters who did not cast a ballot in 2002. This race is looking tighter than it did last week but I'm sure Elizabeth Dole would happily trades places with Kay Hagan in the polls if she had the choice. The deciding factor for President in North Carolina could be the weather on November 4th. Barack Obama is banking a huge lead among early voters, 63-36, who account for about a third of the likely electorate. But John McCain is up 53-42 with folks who plan to vote between now and election day. A rainy day could be to Obama's considerable benefit. The tightening over the last week can be tied back to North Carolina voters reverting more to their usual trends. Obama had pulled to within 55-39 with white voters, but McCain's advantage there is now back up to 60-36. McCain is also doing a better job of peeling off Democratic voters now, up to 19% compared to 14% a week ago. The percentage of poll respondents listing the economy as their top issue is below 60% for the first time in six weeks and that may have some culturally conservative white Democrats back to voting on values issues instead of the economy. Nonetheless Obama still leads on the strength of a 51-39 lead with independents, a 65-24 advantage with folks who didn't vote in 2004, and his customary strong support from black and young voters. But our ABC affiliate's local news was on where I was eating dinner tonight so I didn't have much choice. The third or fourth top item was a breathless declaration that the race for President is rapidly tightening. The reason? Zogby's volatile tracking poll where there was apparently an amazing four point turn in John McCain's direction in one day! They of course did not complement this at all by looking at any other national polls where there continues to be little or no movement. Anytime something like this happens where the media exclusively covers an outlier poll I gets calls like 'what's wrong with Obama?' 'Is Bev finished?' And so forth. There's no doubt they have a lot of power to shape perceptions, I just wish they would use it more responsibly. As long as I'm talking about 'on the ground' stuff in North Carolina, I know a lot of people have been concerned about the odd ballot we have here where casting a straight ticket ballot does not include a vote for President, and you have to vote for that separately. I went to vote yesterday and the poll workers were positively smothering in making sure I understood the quirks of the ballot. Like I seriously was informed about it by four different poll workers during my voting experience. I don't know if people are being as conscientious about it everywhere but at least based on what I encountered I wouldn't worry about it too much. -Overwhelming support for Barack Obama. This is not particularly surprising but the extent of it is still a little remarkable. He's up 55-24 with them in Ohio, 61-24 in Virginia, 68-24 in Indiana, and 64-26 in Florida. -An unusual level of undecideds. 21% of new voters are undecided in Ohio. It's 15% in Virginia, 10% in Florida, and 8% in Indiana. All of those figures reflect higher undecideds than in the population at large. Are those folks really going to vote if they haven't before and don't have their minds made up? I'm not sure what the deal is there. -Lots of independents, few Republicans. In Indiana 46% are independents, 38% Democrats, and just 16% Republicans. In Virginia it's 49% Democrats, 41% independents, and 10% Republicans. Ohio is 54% Democrats, 28% independents, and 18% Republicans. Florida is 45% Democrats, 35% independents, 20% Republicans. -Minority voters are coming out. Blacks and Hispanics combine for 27% of the overall vote in Florida but 53% of the newcomers. In Ohio 23% of new voters are black compared to 12% of the electorate. In Virginia it's 30% for newbies compared to 20% total. The difference is less significant in Indiana- 12% of new voters compared to 10% in general. It looks like there could be a shift of as many as 20 points in the Democratic direction in Virginia relative to 2004. -A major shift in suburbia. When you hear about Virginia's changing electorate, this is where it's happening. Suburban voters in our poll reported supporting John Kerry just 48-44 in 2004. Now they're going for Obama 58-38. Given that almost half of Virginians describe themselves as suburbanites, this shift explains Obama's success in the state more than anything else. -Independents turned on their heads. This is happening pretty much everywhere but that doesn't make it any less notable. The ones we surveyed supported George W. Bush 46-38 in 2004. Now they're for Obama 48-39. -A big shift with young voters. The ones we surveyed who voted in 2004 supported John Kerry by a narrow margin of 42-36. Now the demographic as a whole support Obama 56-34. There has been little movement in Virginia since PPP showed Obama leading there by eight points two and a half weeks ago. -Strong support from independent voters. He's up 48-39 with them in Virginia. -A party that's just as unified as the Republicans are. For our third Virginia poll in a row he is actually doing slightly better with Democrats- 89-8- than John McCain is with Republicans- 88-10. -A competitive performance with white voters. He trails only 53-42 with them in a state where McCain would likely need at least a 60-40 split to win. -Overwhelming support from new voters. He's up 61-24 with those who did not vote in 2004. -Voters making their choice on the economy. 59% of them are, and Obama has a 63-32 lead within that group. Mark Warner leads Jim Gilmore 60-32 for the state's open Senate seat. One of the things we're doing with our polls right now is asking folks who they voted for in 2004, so that we can get as a clear picture as possible of what voters are changing their preferences and fueling this large movement toward Obama. This goes against the conventional wisdom a little bit but some of Obama's strongest gains in Ohio have come among small town voters. Folks in those places reported voting for Bush by a 54-35 margin but are now supporting Obama at a 48-45 clip. Small town voters crossing over from Bush to Obama only account for 2.5% of the sample but even then it's an interesting profile to look at. 100% of them are white. 54% are independents and 38% are Republicans. Sound like an unusual Obama voter? Well 71% of this crew says the economy is its top concern, and that appears to be transcending any cultural differences. There has also been a major swing among independent Ohioans toward Obama. In 2004 they reported going for Bush at a 51-38 rate. Now they're planning to vote for Obama 48-36, a 25 point shift since the last election. One thing that seems to be getting lost in the shuffle right now is that young voters really were not that overwhelmingly supportive of John Kerry. The ones under 30 in this survey reported going 48-35 for the Democrat four years ago- they're now supporting Obama 64-28. There has been movement in Obama's direction relative to John Kerry in every demographic we track. Barack Obama is up by seven points in Ohio, a result almost identical to a PPP poll conducted in early October that showed the Democratic nominee leading by six points in the state. -A 48-36 lead with independents. -Strong party unity. Ohio was one state where a Puma effect really did show itself over the summer. But now Obama is winning by almost the same margin with Democrats- 86-10- as McCain is with Republicans- 87-11. -Obama is keeping it competitive with white voters. McCain only has a 49-46 lead with them, and given the state's 12% black population and their almost unanimous support for Obama, he really needs to be up at least ten with whites to take the state. -60% of voters in the state list the economy as their top issue, and Obama has a 63-33 lead with them, giving him an 18 point lead in the grand scheme of the poll based on those respondents. McCain leads by 11 with folks who list anything else as their top issue. -Obama leads 55-24 with folks who didn't vote in 2004. Republicans are gleeful about a new Gallup study out earlier this week suggesting that there may not be a large increase in youth turnout this year. They're missing the point though: the strength Obama derives from young voters isn't necessarily about the quantity of their vote. There's been a major shift toward the Democrats in that age category relative to 2004 that will have a strong impact on the race whether there's a disproportionate increase in turnout or not. So let's say that young voters again comprise 17% of the vote nationally, as they did in 2004. A 17 point gain with 17 percent of the electorate is a three point gain for Obama, enough to make up the margin by which the Republicans won the popular vote nationally right there. Add in your increase in turnout from black voters and the white voters of all ages who chose Bush in 2004 but are going for Obama this year and you have the equation for a strong Democratic victory. I've never really bought some of the pundit chatter that Pat McCrory is doing well because people are looking for change across the board. I think McCrory's polled surprisingly well because Bev Perdue has run a cruddy campaign, until recently. This month's Civitas poll provides some evidence to back up what I've been thinking. They asked which candidate for Governor represents the change you want to see. The result? 43% said Perdue and 41% said McCrory. Perdue's standing on that account is actually a little better than her standing in the horse race on this poll, which shows the race tied. When it comes to bringing change to the Legislature, 44% say the Democrats are the ones to do it while just 34% say the Republicans are. Is the Senate really going to flip this year? Not with those numbers. And I think we'll see Democratic gains in the House. I am sure there are some of our 90th percentile voters- the most informed ones- who know that the Democrats run Raleigh and the Republicans run Washington and want to kick out those in charge on both fronts. But I think there are very few voters who pay enough attention to state government and things like DOT reform for McCrory, running as a Republican, to really get a lot of people to think he's the change candidate. Bev Perdue's been saying a lot lately that the economy is the only issue in this election. She's right, but her campaign didn't reflect that until very late in the game. They're on the right track now though. She's gained seven points over the last three weeks, and it'll be interesting to see how that one stacks up this weekend. There is no doubt that early voting statistics are bringing a lot of good news for Democrats in North Carolina. I would caution against getting too hyper about it. For instance blacks have so far made up almost 29% of the electorate. It's important to keep in mind that during the primary 40% of early Democratic primary voters were black, but they only ended up comprising 34% of the total electorate when you factored in the election day voters. These early figures reflect a definite enthusiasm gap. It's also a lot easier to vote early in larger counties where a ton of sites are open at a wide variety of hours- those sorts of places tend to be more Democratic. Both those things said, the news is very good. On the North Carolina tracking poll this week we'll ask people whether they've voted yet or not, and we will dig deep into those numbers on Monday to try to get a picture of what sort of electorate we can expect going into election day as well as whatever lessons we can learn about the voting preferences of those who have already cast their ballots- down ballot fatigue, ticket splitting, etc. We're also going to have new polls next week for NC-8 and Wake County, each of which should give us a more detailed view of what's happening in some key parts of the state. -Georgia. Competitive Senate race and a possible sleeper state for Obama, although I have a feeling he'd be spending more money and contesting stronger there if he really felt like he had a chance at taking it. -Wisconsin. 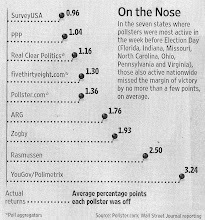 It's still on the list of Nate Silver's tipping point states, almost all of which we intend to poll next week. We were the best pollster there for the Democratic primary. Voting will be open until Saturday. If there is one thing that I have found to be an absolute truism as a pollster in this year's election, it's that Barack Obama's supporters are harder to get in touch with than John McCain's and Hillary Clinton's. This trend has continued in the general election. We conducted half the interviews for our Florida poll this week last Thursday night. The first night McCain led by 2. The data based on callbacks over the next three days gave Obama a 4 point lead. It was a similar story in Colorado two weeks ago. The first night Obama led by 5. The rest of the field period he led by 15. I don't think there was movement in Obama's direction in subsequent days either of those times. It's simply a matter that you have to try more times to get his supporters on the phone. Which leads me to today's Quinnipiac Ohio poll showing Obama up by 14. That's a big difference from Rasmussen and Mason Dixon's polls earlier in the week that showed McCain winning, and I think part of the discrepancy can be traced back to the length of field time. Rasmussen's was a one night poll. Mason Dixon's was a two day poll. They couldn't have done that many, or any, callbacks to get folks on the line who weren't at home on the first shot. Quinnipiac was in the field for six days, and I'm guessing they managed to get a lot more of those elusive Obama supporters polled when they tried for the third or fourth time. Another thing to consider when looking at polls is the number of respondents- not just whether it's a large or small number, but whether it's a nice even number or not. If it's a nice even number a lot of the time that means a pollster is just getting a set number of interviews and then stopping. That may have the potential to undercount support for Obama, again because his folks are harder to find. If it's a random number, that's an indication that folks have their sample and they've decided they're going to call everyone in it 'x' number of times and try to get as many respondents as they can get. We're not going to be putting out Quinnipiac sort of numbers on Ohio this weekend: more like Suffolk numbers. But from my experience anyway the issue of field periods and round numbers may help to explain at least some of the 16 point difference you see between Rasmussen and Quinnipiac. We're now down to 4% of voters in North Carolina undecided and 7% of those who do have a preference open to changing their mind. That means the campaigns are spending a whole heck of a lot of money to try to win over 10-11% of the electorate. Who are these folks that still don't have their mind completely made up? Both John McCain and Barack Obama have extremely solid support, although there are a few more Obama supporters open to changing their mind. 96% of McCain's supporters say they are definitely going to vote for him, while 93% of Obama's do. Looking at folks leaning toward Obama who might flip, they're folks voting on the economy who probably supported Bush in 2004 and aren't 100% comfortable casting a ballot for a candidate who might be more liberal than they are. 38% are small town voters, compared to just 27% of the population overall. John McCain is going to need to either convince those folks that he will be as good on the economy as Obama, or that they should decide who to vote for based on other criteria. Although Bob Barr has dropped to the 1-2% range in our polls that remaining support is still pretty weak. Just 37% of respondents expressing a preference for him said that they would definitely vote for him. I think those folks are undecideds 'parking' with Barr, and that his actual final share of the vote will be less than 1%. -The voters in the middle come heavily from two types of places that supported George W. Bush in 2004 but have been moving Democratic this year: suburban and small town voters. 70% of not completely decided voters are coming from those places even though they only account for 58% of voters overall. What you're seeing there is folks who are unhappy with the Republican Party but aren't totally convinced the Democrats would do a better job, so they're not sure which way to go. -It's actually a pretty young segment of the electorate. 29% are under 30 and 62% are under 45, compared to just 16% and 44% for those figures in the population as a whole. While the intensity of Barack Obama's support has certainly been much higher among young voters, it appears some still have their doubts about both candidates. -They are heavily concentrated in eastern North Carolina- more than a third of them are there even though only about a quarter of total voters are. I think this is definitely your registered Democrats who usually vote Republican in the Presidential election trying to decide if the economy's bad enough that they can vote for a candidate they disagree with on a whole bevy of social issues. Throw out your voters who aren't completely committed and Obama leads McCain 47-42 here with Bob Barr picking up 1%. So Obama only needs to win about a third of the rest of the voters to take the state. He should be able to pull that off if there's not a big shift in the trajectory of the campaign over the next couple weeks. When the DSCC started pummeling Elizabeth Dole in August, this election became pretty much solely a referendum on her. Dole could have survived that. North Carolina voters really liked her the first time she ran in 2002 and I don't think that really changed all that much in the last six years, even if some think she has not been a particularly good advocate for the state. The problem is that instead of responding by putting Dole on the air, talking straight to the camera and saying that the ads were unfair and talking about what she had accomplished for North Carolina, her campaign just ran a bunch of mediocre negative ads against Kay Hagan, a politician we're probably going to be sending to the US Senate in two weeks who most North Carolinians know very little about. The Dole response completely missed the boat: the election at this point has little to do with Kay Hagan and everything to do with Elizabeth Dole. The Dole campaign needed to respond to the DSCC attacks by reminding North Carolina voters why they like(d) Elizabeth Dole. But they didn't do that, and at this point it's probably too late. They let the DSCC define Dole in the voters' minds, and her campaign was way too slow to put its best asset- the candidate herself- forward so that she could try to redefine herself. Dole could still win, but it's looking increasingly unlikely. We're going to have new polls in Ohio and Virginia over the weekend. They went in the field tonight, and they're looking good. I think the tightening in Florida is the exception rather than the rule. Other than North Carolina at the start of next week that'll be it for state polls until next Friday, when we'll release our first wave of final polls. We'll release a second, larger batch the day before the election. For the most part we know where we're going to be polling, but we need to decide the final two states, and we're going to let you decide. There are four states in the running for the last two slots, a pair of western states and a pair of eastern states. We'll pick one from each of those categories to poll based on your votes. -Washington. Obama is obviously going to win this state but it's worth polling for what may be the tightest Governor's race in the country, the rematch of the 2004 contest between Christine Gregoire and Dino Rossi. -Montana. The down ballot stuff here isn't very interesting but some polling has shown it competitive in the Presidential race and Obama has been a constant presence in the state. The poll is at the top of the page and voting will be open until noon Thursday. Later that day I'll put up the choices for the final eastern poll. Hey, it worked! You got a bunch of hits on your web site! Congradulations you sleaze. Will you be part of the intelligencia of the new regime? This guy is on to us! Senator Obama, if you are reading this, I was hoping for the appointment to the Court of St. James. But if you feel like you need to hook up Quinnipiac or Research 2000 first for their more friendly poll numbers I'll settle for Denmark where I can get in touch with my ancestry or Japan where I can still go see quality baseball several times a week. In all seriousness though, we have gotten much less vitriolic e-mail and phone calls during the general election than we did during the primary. I don't know if people are just less emotional about it or what but it's been nothing compared to how nasty both Obama and Clinton supporters acted toward us at various times when they didn't like polls we put out. -The white voters there are less conservative. The average of our last three Florida polls has Obama trailing by 18 points with white voters, 56-38. Our last three Ohio polls show Obama down by an average of just 12 points, 51-39. -Florida just has too old of an electorate. We think voters over 65 will make up 22-25% of the folks turning out this year in Florida, and Obama is trailing on average with them 54-40 in our post-convention surveys there. Obama has a tough time with older voters in Ohio too, but his average deficit with them there is just 47-43, and either way they're not nearly as significant a part of the electorate. We think they'll account for 18-21% of the vote there. -Florida Hispanics just aren't breaking for Obama the way they are everywhere else. The primary reason that Florida could be a better state for Obama than Ohio is that its non-white segment of the electorate is much larger. But since Obama is actually trailing with Hispanics in Florida right now that isn't doing a whole lot of good for him. He is faring better with them than white voters, but given that he's doing much more poorly with white voters in Florida than Ohio it's not enough to make the difference. Of course this discussion is pretty elementary since Ohio and Florida have lost their must win status. Given how strongly he is doing in Virginia and Colorado, I believe Obama could lose both of these difference makers for George W. Bush and still have a 90% chance of winning the election. Nonetheless if the election was today I think Obama would win both of these states, although the margin in Ohio would be a little better. Florida has tightened up a little since PPP's last poll of the state, with what was a 49-46 lead for Obama now 48-47. There has been some movement in John McCain's direction with both white voters and Hispanics over the last three weeks. McCain's margin has increased five points with whites, from 52-41 to 55-39. Hispanic voters, who have swung back and forth both in PPP's polls and those of most organizations conducting surveys in Florida, are supporting McCain 50-46 after going for Obama by the exact same margin in our previous poll. 1) The proportion of the electorate that ends up being white voters relative to the proportion who end up being black voters. We are projecting white voters at 69-70% and blacks at 13-14% and right now McCain's solid support with whites and Obama's overwhelmingly strong standing with blacks are basically canceling each other out. But if the final turnout figures end up skewing either more or less African American, depending on the success of Obama's turnout operation, that will have a major impact on the race whichever way it goes. 2) Because the white and black votes are practically a combined wash right now, Hispanic voters have the power to tip the election one way or another in these closing weeks. Most polling has shown the race extremely close with that demographic. If their votes tip strongly to either McCain or Obama in the closing, the person that benefits will win the state. I think those are the main two things to watch in the final weeks in Florida. Both candidates are having more trouble winning over their party's voters in Florida than they are in most places. Obama gets just 80% of Democrats while McCain is earning only 82% of Republican voters. Independents are going heavily for Obama, 52-35. McCain is up 49-47 with folks who voted in 2004 while Obama has a 64-26 lead with new voters. Dalton appears to now be pulling away in this race after most of our previous polling showed it in the margin of error. Please run against Richard Burr. You will win. Atkinson, like Dalton, is starting to pull away. Bev Perdue is out to the largest lead she's had in a PPP gubernatorial poll since August. The issue of Yankee trash may end up being what puts Perdue in the Governor's mansion if she is able to pull out a win in this race. One of the essential problems plaguing her campaign has been that while Pat McCrory is racking up huge margins in the Charlotte metro area, Perdue has not been matching him with an unusually strong performance in her home base of eastern North Carolina. She may have found the issue to help her do that though. Perdue this week leads 55-37 in northeastern North Carolina and 50-40 in southeastern North Carolina. Even though Barack Obama and Kay Hagan are running better than Perdue statewide, she is now for the first time strongly outrunning them in the east. Obama is up 4 in the NE and tied in the SE while Hagan is down 6 in the NE and up 5 in the SE. A week ago the race was basically tied in eastern North Carolina. The Yankee trash doesn't get dumped on Charlotte, or Greensboro, or Raleigh. It gets dumped in the east, and making that an issue over the last week seems to really be helping Perdue in that area. Another way to look at it: last week McCrory had an 18 point lead with rural voters. That's now down to 11. Perdue is now leading by six with small town voters. She previously trailed by one. A lot could happen between now and election day, and this race certainly remains a tossup. But if Perdue really has turned the tide, it looks like Yankee trash is carrying the day. Where have all the PUMA's gone?